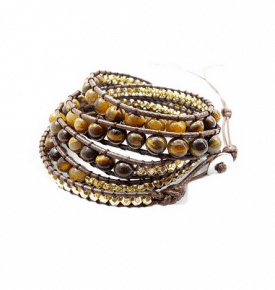 If you are a little more experienced in meditation, or are serious about taking your spiritual journey a step further, then consider the Kundalini Yoga Prayer Beads. 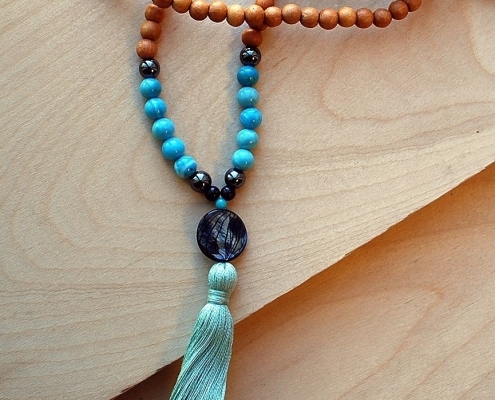 It is a powerful healing mala in terms of mending one’s spirit. 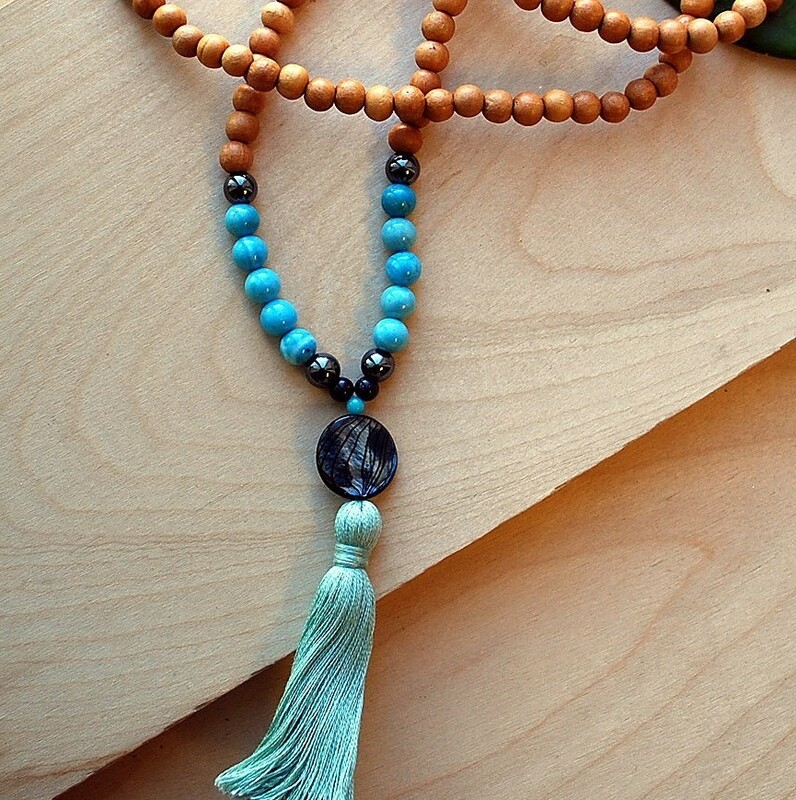 The inspiration for the chosen beads in this mala (sandalwood, amazonite, hematite, abalone shell) are the Dzogchen practices and Kundalini Yoga. While that might sound like a mouthful, the practices are simple to understand. Dzogchen meditation enables your Self to experience its true nature as well as the nature of mind. Kundalini Yoga unleashes your creative potential by awakening potent feminine energy that lies dormant at the base of your spine. 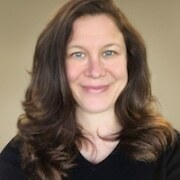 When one combines this creative energy with an open, meditative mind that accepts the present moment, it creates an individual rooted in his or her spiritual path. Even those new to meditating with mala beads will discover great clarity and illumination with the Kundalini Yoga Prayer mala. 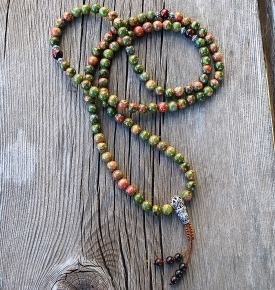 This bead is the core of the Kundalini Yoga Prayer Beads. Sandalwood works to connect the chakras when one is feeling stressed or rushed in working life. 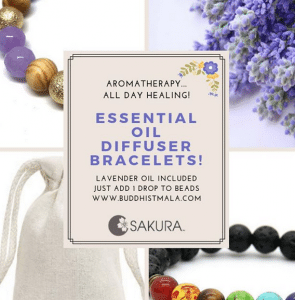 It facilitates meditation powers by wearing it, and is ideal for accessing deeper levels of consciousness when used frequently with a routine meditation practice. To meditate regularly sounds like a task, but it is simply mindfulness in daily activities, which is what Dzogchen is about. Known as the Stone of Truth and Stone of Courage, Amazonite emboldens the wearer to embrace his or her own truths, values, and personal integrity without self-doubt or fear of judgments from others. It also soothes the overly emotional mental state by bringing it back to clarity. Amazonite is ideal for meditation to bring self-awareness and encourage living in truth, making it a rather empowering stone on a spiritual level. Not a crystal, but a mineral with high iron content (often associated with Mars), Hematite brings strength, courage and will power. When used properly in meditation, it creates a protective layer around the aura so that unwanted energies do not intrude, while simultaneously grounding the root chakra. As you experience this grounding, the vibrations from the higher chakras easily connect to the lower ones. 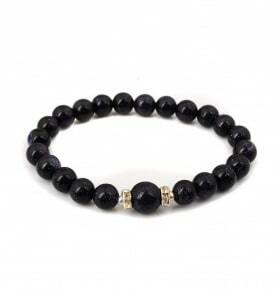 Hematite also serves to bring clarity and de-clutter the mind of negative thinking patterns. Beautiful due to its iridescent colors when it catches the light, it draws viewers in and instantly uplifts the spirit. The gentle powers of abalone shell are warm and loving: it calms nerves in times of stress, enhances communication and harmony in relationships, as well as in a community setting. When used in meditation it can open up intuitive and psychic abilities. The power of the Kundalini Yoga Prayer Beads is a wholesome combination of grounding energies, spiritual integrity, gentleness and strength. 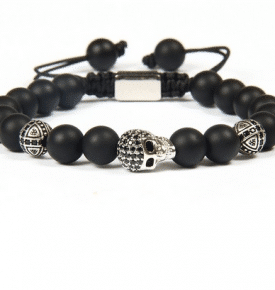 This set of Prayer Beads is highly recommended to those looking to grow in deeper ways while expanding consciousness and connecting to creative potential. The benefits are plentiful on different spiritual levels, depending on how deep you are willing to go. Only you can determine that. Remember, in the end, only you are responsible for your own spiritual progress.